Kyle Kuzma scored a game-high 29 points, and the Los Angeles Lakers snapped a five-game losing streak with a 111-106 victory over the Sacramento Kings on Sunday night at Staples Center. 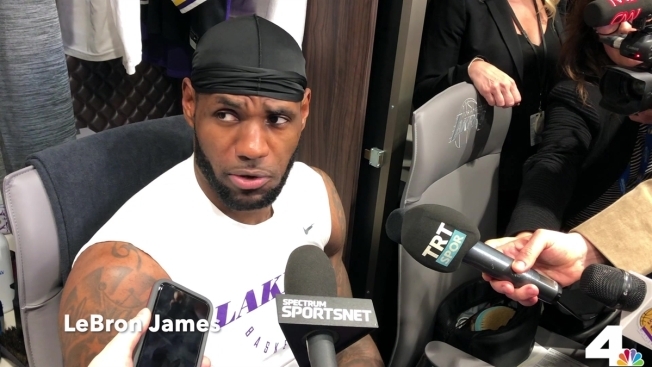 Los Angeles Lakers players LeBron James, Kyle Kuzma, and JaVale McGee discuss their victory over the Sacramento Kings on Sunday, March 24, 2019, and how they need to 'respect the basketball Gods' the rest of the season. Kyle Kuzma scored 29 points, and the Los Angeles Lakers snapped a five-game losing streak with a 111-106 victory over the Sacramento Kings on Sunday night at Staples Center. The game featured two teams that are on the outside looking in when it comes to the NBA Playoffs, but both teams have bright futures ahead if they can keep their young core intact. So imagine for a second that you're a highly acclaimed NBA General Manager. You have your pick of jobs, and these two teams are at the top of your list. Both teams have a core of talented young players you can build around. The Kings have forward Marvin Bagley III, and guards Bogdon Bogdanovic, Buddy Hield and De'Aaron Fox. The Lakers' core consists of forwards Kyle Kuzma, and Brandon Ingram, and guards Lonzo Ball and Josh Hart. Who Should Start Opening Day for Dodgers? Which franchise would you choose? If Sunday was any indicator, it's the Lakers, and three of their four young stars weren't even on the court, whereas all the young royals were available for the Kings. "We're both young talented teams," said Kuzma of both young cores. "We have a lot of great talent here, we just have to stay healthy. Give them a lot of credit, but I want to see what next year looks like when guys are hopefully fully healthy." Without Ingram, Ball, and Hart, Kuzma scored 21 points in the third quarter, and finished with 29 points, tied with LeBron James to lead all scorers. "I got out in transition a little bit more than in the first half," Kuzma said of the third quarter in which he made 7 of 8 shots, including five three-pointers. "My shots went in and I just trusted my form in the first half and stayed with it in the second half." James, under contract for the next three years, recorded his eighth triple-double as a Laker, finishing with 29 points, 11 rebounds, and 11 assists. "When I'm on the floor I have to play my game no matter what our circumstances are," said James. "I've always respected the basketball Gods, and when I'm on the floor I've to play as hard as I can or do something to affect the game. Not cheat the game. If I'm in uniform and on the floor I've got to try and make things happen." JaVale Mcgee followed up his career-best performance with another double-double, 17 points and 14 rebounds. "I'm just trying to stay in the right places and my teammates are finding me," said McGee of his terrific two-game stretch. "I'm focusing on getting on the offensive boards and it's really working for me." The quartet of Bagley III, Bogdanovic, Hield and Fox combined for 69 of the Kings 106 points. Bagley led the way with 25 points and 11 rebounds. "I feel pretty good," said Bagley III who missed 17 total games this season. "It's just about finishing off these last few games we have strong and leading that into next season." The Lakers led by as many as 17 points in the third quarter, but the Kings came roaring back and cut the lead to two, with just over six minutes remaining in the game. Los Angeles was able to hold on down the stretch, thanks in part to their free throw shooting as the team shot 20-for-24 from the charity stripe for an 83 percent clip. "We just closed the game down the stretch," said Kuzma of the final few minutes "We didn't have too many turnovers at the very end. We got rebounds, and we made our free throws." Sacramento had 13 steals in the game compared to just four for the Lakers. They also had less turnovers than the Lakers who had 20 turnovers to the Kings seven. Los Angeles won the season series three games to one, with the only loss coming on a three-point buzzer beater by Bogdanovic on Dec. 27, 2018. "They had our number this season," said Kings' head coach Dave Joerger. "They're awfully long and do a great job against us, but I was proud of our guys tonight. We didn't let go of the rope." Lonzo Ball (left ankle sprain), Josh Hart (right knee), Reggie Bullock (plantar fasciitis) and Brandon Ingram (shoulder) all missed the game due to injuries. The Lakers will host the Washington Wizards on Tuesday at 7:30PM PST.